"The work (with iDesign)we have been collaborating on in Australia is considered ‘best in class’ in the Haier world." Haier, the number one brand of major appliances in the world, briefed iDesign to showcase their new T Series fridge range. Competitors in store were driving the category with large end caps. 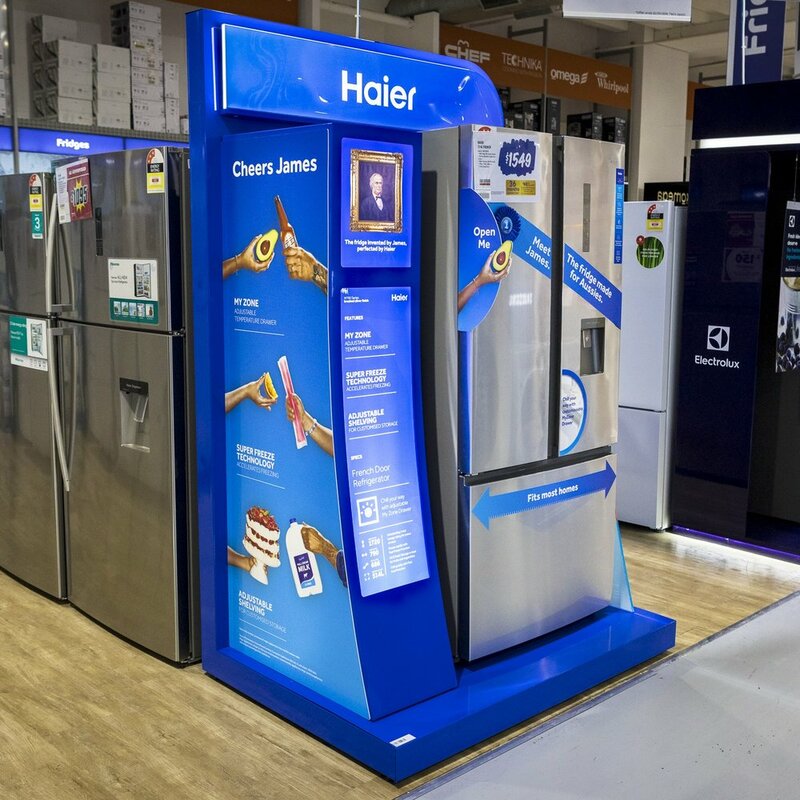 Haier required a solution that was on brand, simple to assemble, as well as easy to change multiple sized fridges across the range. All graphics were inter-changeable with the header and front left display box illuminated. National rollout, designed, manufactured, warehoused, and installed by iDesign. 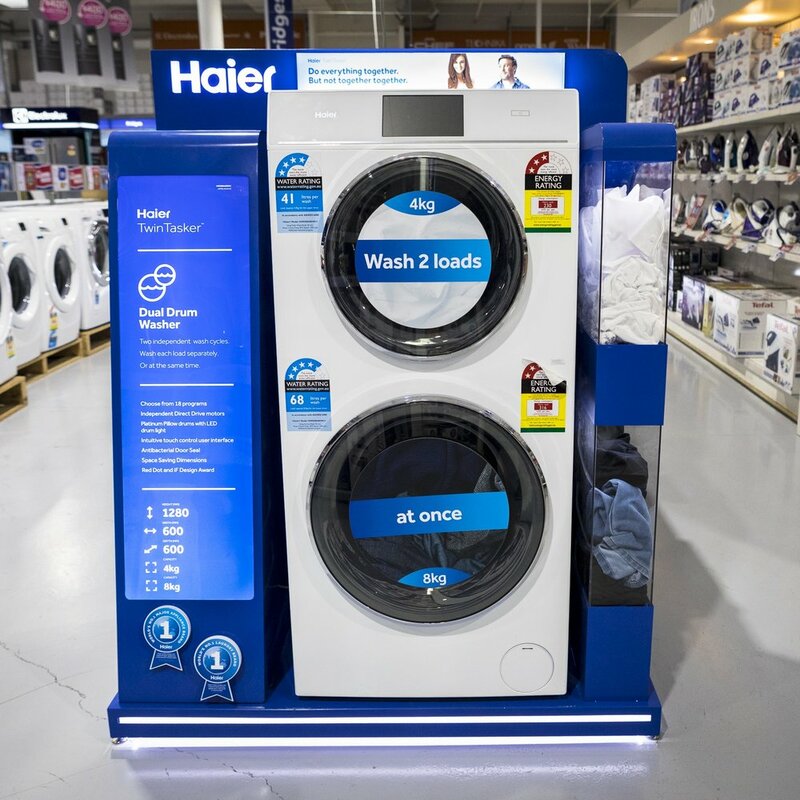 Results: Immediately Haier were more prominent and now have the opportunity to own space instore across multiple retailers. We are in the process of designing updated Haier units for future instore installation. This project required a 3.6m x 2.8m high engagement area to display the full range of Air Conditioners in premium retailers. Key design elements were illumination, navigation and information sharing, structural yet easy to assemble (and transport), to minimise store disruption and keep manufacturing costs down. Constructed of steel and wood with a 2 Pac painted premium finish to the display, iDesign designed and manufactured in China, and oversaw logistics on installations around Australia. 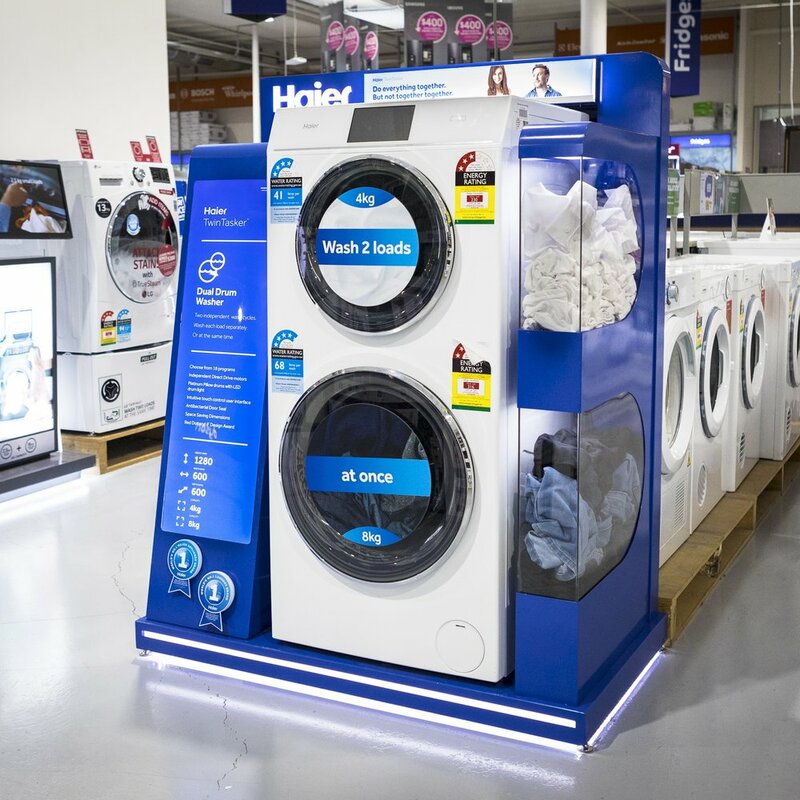 Haier briefed us to showcase their innovative new Twin Tasker Dual Load Washer to the Australasian market. Designed in two sizes for end caps in multiple retailers, but suitable as a stand-alone fixture when required, the clever solution showed an LED illuminated acrylic representation of twin tubs on one side, and key information/branding panels around the display, highlighting key messaging in 360 degrees. The use of Pixalux® light panels for signage, header and base, allowed illumination to key areas on the display. A soft white halo of LED down lighting under the base drew attention and grounded the display. The metalware structure came fully assembled with minimal installation required onsite ensuring non disruption over the busy Christmas period.